Thunbergia mysorensis is a stunning, vigorous vine from southern India where it climbs through trees in tropical montane forests. It has become naturalized in Mediterranean climates and elsewhere due to its popularity as an ornamental plant. The generic name commemorates the Swedish botanist Carl Peter Thunberg, one of Carl Linnaeus's pupils and a prolific collector of Asian plants. The species epithet is a reference to the city of Mysore (today Mysuru) in the Indian state of Karnataka. Thunbergia mysorensis has pendulous racemes of striking, red and yellow inflorescences. 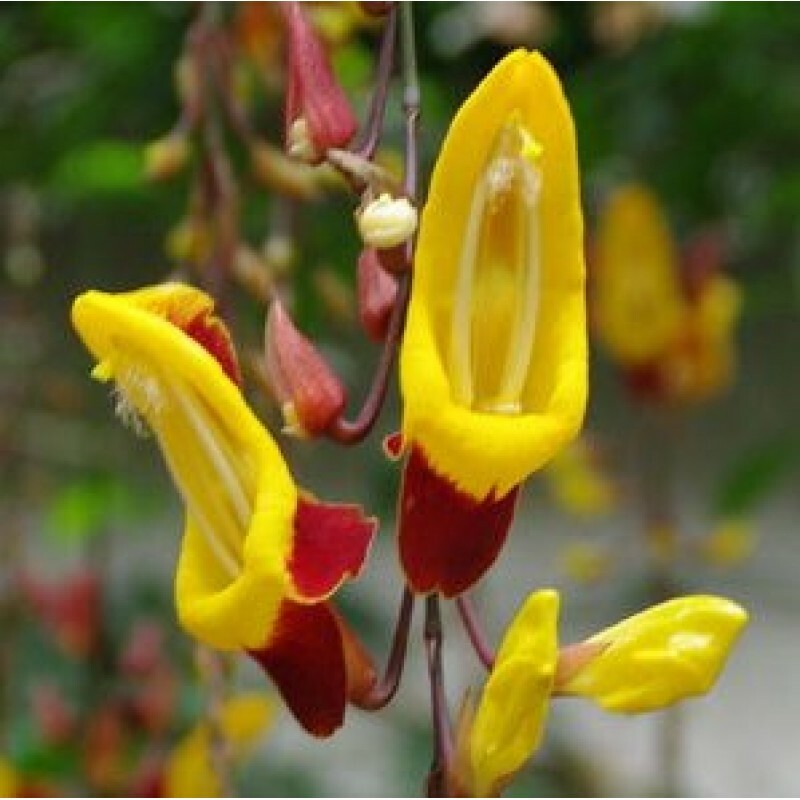 Each flower is up to five centimeters long with showy red bracts. The tubular flowers are bilaterally symmetrical, consisting of five fused petals. The petal tips are colored red which are reflexed to expose the yellow throat, the large stamens, and feathered stigmas. A great number of growers from around the world have chosen this one, and rightly so. In flower almost every day of the year, a mature vine bears hundreds of 3" yellow and rust red flowers in spectacularly long hanging chains. The vine often reaches 20 feet (6 metres). Oppositely arranged ovate-lancelike leaves are 5-6 inches long, and handsome dark glossy green. Flowers are large, in long pendulous interrupted racemes. The plant is more delicate in appearance than its blue flowered cousins. The plant is a popular garden item because of its attractiveness to hummingbirds. This vine is shy of seeding and has to be propagated by layering. Flowers in the cold season. In its native range, Thunbergia mysorensis is pollinated by sunbirds. Where it has naturalized in the Americas it's abundant nectar is a source of food for hummingbirds. As they feed, the heads of visiting birds become dusted in pollen, which is transferred to other flowers. Pollination is completed because of the position of the anthers and the stigmas, held against the inner and upper surface of the reflexed corolla. In temperate zones, Thunbergia mysorensis is a conservatory or greenhouse plant. It requires a winter minimum of 12 degrees Celsius in full sun or partial shade. The stems twine clock-wise and as they mature this produces an ornamental effect, similar to Wisteria floribunda. Pruning is best completed in spring by thinning the crowded stems. It will produce single flowers in the axils of the leaves, but to produce its striking pendulous racemes, this climber requires a run of several meters. These inflorescences are often more than 30 cm in length and create a dramatic display. Thunbergia mysorensis originates from a monsoon climate and so requires plenty of water over summer.